Green Kids Press LLC, 9781939377586, 40pp. L.T. has become THE NEW RECYCLING HERO! The series is about his adventures in recycling creatively with its' colorful, whimsical illustrations, nostalgic look and inspiring messages reminding us all that... We Still Need to Recycle, Go Green, Be Environmentally Friendly and Help Save Our Planet...for our future generations. L.T. will inspire and empower young ones; by helping them to understand that everyday tasks like reducing waste, reusing, re-purposing things and recycling has a real positive effect in our lives and in the world. This educational series is non-fiction and is based on events from the author’s own childhood. 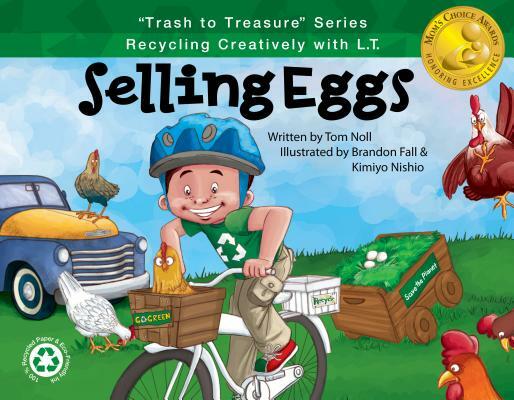 It will inspire young readers to rethink, reinvent, recreate, reuse and recycle in ways that are both practical and fun! Both Books are great looking and have a great feel to them in hardcover 11 x 8 1/2 books on 100% Recycled Paper, Soy Ink and Super Matte Non-Scuff Cover. They include printed educational end sheets and are for ages 4-10. Each book retails for $17.99. Tom is a native of Somerset, Ohio and is an artist, sculptor, landscape designer, recycler and advocate for going green. He is well known in the Washington, DC metro area for his popular and imaginative White Bicycle Fence Art Installation at the Heart of Bloomingdale Park which he decorates for major holidays and becomes a tourist photo site. Tom has been featured at Book Expo America (BEA), American Librarian Association (ALA) Conventions and Green Festival and a popular featured reader at multiple events all over the Mid-Atlantic area. He is a requested author for visits to primary schools, local libraries, and special events for his storytelling abilities when doing readings and signings of his books as well as for his interactive puppet show with a Q&A afterwards. Brandon has always loved illustration and spent countless hours of his childhood getting lost in his drawings. He is now fortunate to make a living continuing to do what he loves from his home in California. Brandon’s illustration and design work has appeared in a number of publications and has won awards. When he’s not illustrating, he enjoys spending time with his wife and children in the beautiful outdoors. A graphic designer and illustrator based in sunny greater Los Angeles area, California, Kimiyo loves print design such as creating logos and packaging, but illustration has been her all-time favorite thing to do since she was a little girl. Regardless of what she creates, she is passionate about what she does and loves to inspire people by creating something that speaks to their heart.